Rules revision coming soon! Stay tuned! 10 am and 11:30 on Saturday February 27th. Judging begins at 11:45 am. Many thanks to our Sponsors and Donors, we couldn't do it without you. The Final Tally is in. The final tally is in and thanks to all the love and support from the community the Olympia Bakers Guild will donate $10,000 to the Thurston County Food Bank, an increase of about 33% from last year. That's the power of pie. See you next year on fourth Saturday in February. 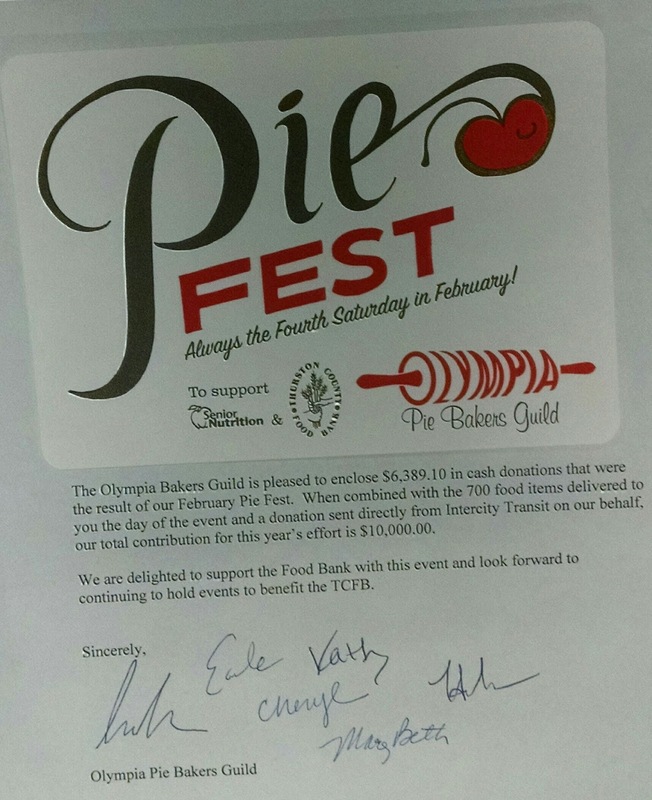 So grateful for the help at Pie Fest 2016 from other community groups, the South Puget Sound Community College Baking and Pastry Arts program, the Olympia Food Co-Op, Rockabilly Mafia Dolls Olympia Washington and the Capital Lakefair royalty court. List of winning bakers and pies. Congratulations to the winners and thanks to everyone who baked! We couldn't do it without you! SPSCC Students Make Pies for Pie Fest 2016. A doffing of the toque blanche to the fine folks of the South Puget Sound Community College Baking and Pastry Arts Program. Here's a video of them making 40 pies in support of Pie Fest 2016. Aren't you inspired to donate a pie of your own? 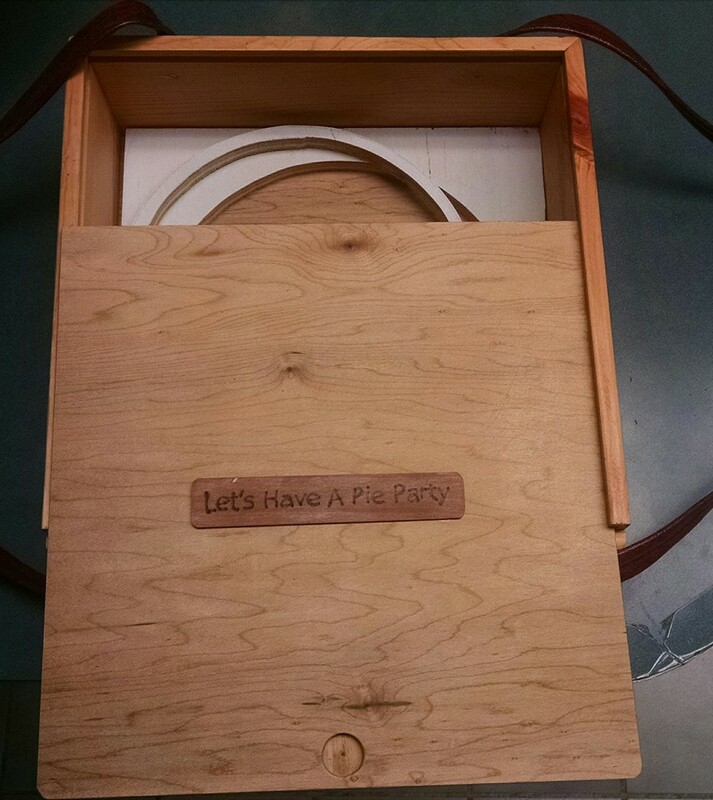 Positive press piece promotes pie party! 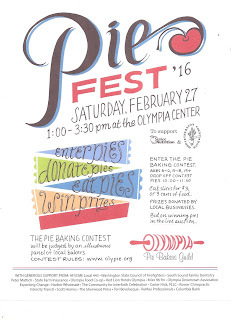 Follow this link to see what The Olympian has to say about Pie Fest 2016 and the Pie Fest 2016 Pie Baking Contest. 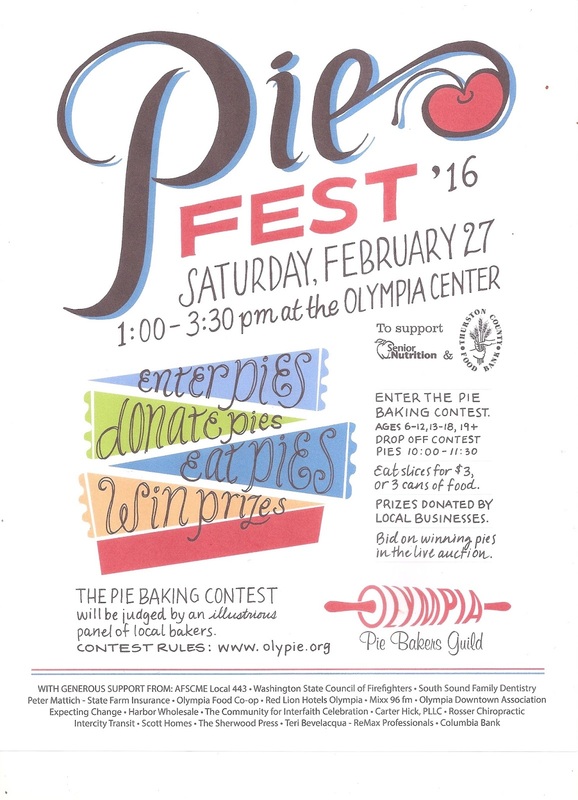 Pie Fest 2016 and the Pie Fest 2016 Pie Baking Contest are just over a week away. Follow the link below to see a great story from ThurstonTalk about the great support we are getting from the Baking and Pastry Arts program at South Puget Sound Community College. Less than 2 weeks until the Pie Fest 2016 Pie Baking Contest ((Entries accepted from 10 - 11:30 am) and Pie Fest 2016 (starts at 1pm)! If you feel like baking but don't want to compete, we are happy to accept your donated pie. No judging, just gratitude for your support of the Thurston County Food Bank and Senior Nutrition Program. And a ticket for a slice of pie during the Fest. We often run short of sugar-free and gluten-free pies. Look, it's the new Pie Fest poster. Click on it for a larger image. The most important ingredient in Pie Fest is, of course, pie. 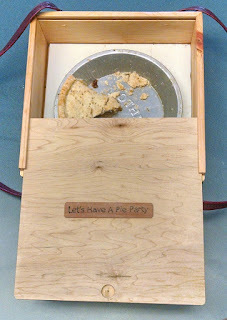 Last year, yes, we did run out of pie. This year as part of our efforts to make sure that this doesn't happen again, we are soliciting and accepting donations of baked pies. Please follow most of the rules of the Pie Fest 2016 Pie Baking Contest EXCEPT you can use a pre-made crust and you don't have to make two pies. We are very happy to accept singles. The most important reason for Pie Fest is to support the Thurston County Food Bank and Senior Nutrition Program. Your one donated pie is worth $24 (8 slices @ $3 ea.) and with their size and connections the food bank can use this to feed a family of 4 for a week. Oh yeah, you get a ticket for a slice of pie too. 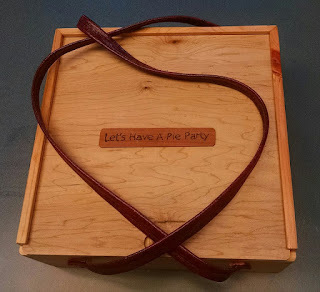 Carry your pie in style! The Grand Prize Winner of the 2016 Pie Fest Pie Baking Contest will take home this custom made, handcrafted beauty. There will be lots of other cool prizes for winning bakers and gift baskets available for auction at Pie Fest 2016. Hope to see you there! Need to learn or brush up your pie baking skills in advance of the PieFest 2016 Pie Baking Contest? Sign up for The Love of Pie, a pie making class we are offering through the Olympia Food Co-op on January 24.